Natures Aid Serrapeptase tablets are enteric coated to allow them to pass safely through the stomach before dissolving. Serrapeptase is an immunologically active enzyme. It can bind itself to the alpha 2 macroglobulin in our plasma where it is shielded from the immune system while retaining its enzymatic activity, and in this way it is transferred to the sites where it is needed in the body. Natures Aid Serrapeptase 80,000iu - 30 Tablets are phthalate free. Microcrystalline Cellulose, Calcium Carbonate, Di-Calcium Phosphate, Serratiopeptidase, Enteric Coating (Ethylcellulose, Ammonium Hydroxide. Medium Chain Trigylcerides, Oleic Acid), Lactose Monohydrate (product of milk). Anticaking Agent (Vegetable Source Magnesium Stearate), Sodium Carboxymethylcellulose. Enteric Coating (Sodium Alginate, Vegetable Source Stearic Acid). Free From: Artificial Flavours, Colours & Preservatives, Yeast & Gluten. Take 1-2 tablets per day on an empty stomach. Do not exceed recommended daily amount. Do not use if seal is broken. Food supplements should not be used as a substitute for a varied diet. Keep out of reach and sight of children. Store in a cool dry place. Below are reviews of Natures Aid Serrapeptase 80,000iu - 30 Tablets by bodykind customers. If you have tried this product we'd love to hear what you think so please leave a review. Got told about these tablets, good for sinus. Been taking them for two months,helping to prevent migraine. 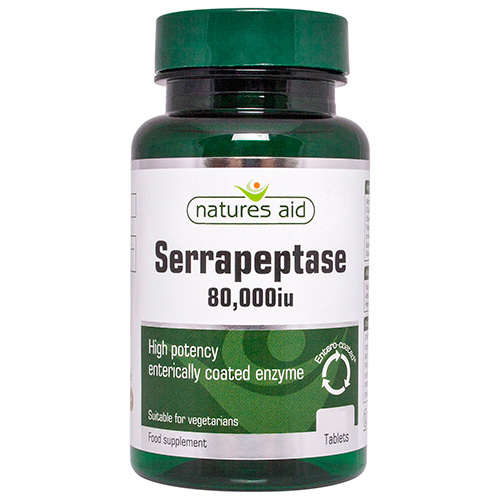 Natures Aid Serrapeptase is an immunologically active enzyme. It can bind itself to the alpha 2 macroglobulin in our plasma where it is shielded from the immune system while retaining its enzymatic activity.